Home » What is the difference between the trial and the full version? Both trial and full versions of CopyTrans programs have the same features. The only difference is in the number of actions permitted. 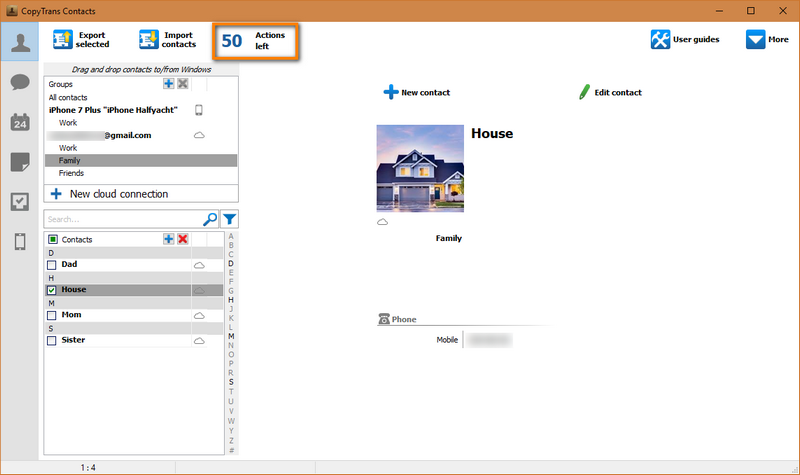 A trial version allows 50-100 actions depending on the program. We offer a trial version for some of our products to let our customers get familiar with CopyTrans apps and make a well-informed decision of purchase. To get the full version, please purchase a license. To purchase a license, please visit our our online store. Once purchased, you will immediately receive the invoice containing the activation code as well as the activation instructions. 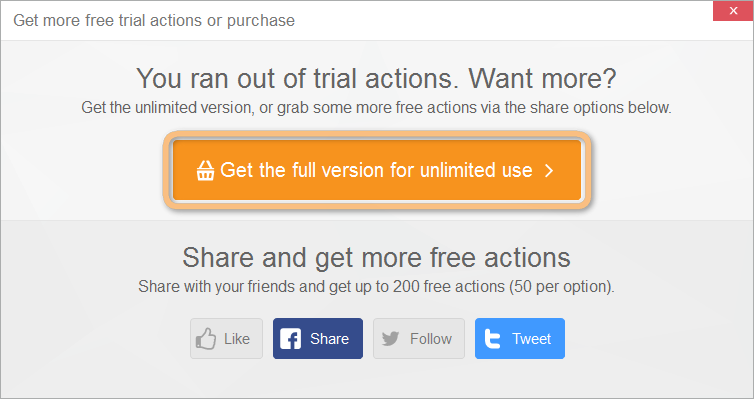 How to get more free actions in CopyTrans? The first time you use the free trial version of CopyTrans you are able to transfer up to 100 tracks from any iPod, iPhone, or iPad to your PC free of charge. But you can get hold of additional 200 free actions by following the steps below! Simply click on a share option. For example, you can like our Facebook page or share about CopyTrans by posting about it on your Facebook Wall. You can also follow us on Twitter or tweet about CopyTrans. Each time your share, you get 50 more free actions. The total of additional free actions you can get is 200. This makes a total of 300 tracks you can transfer free of charge from any iDevice to your PC! Once you’ve given CopyTrans a test drive, you are free to decide whether to purchase the full and unlimited version of the program. Ready? Just click on the “Purchase the full version for unlimited use” button. How to get more free actions in CopyTrans Contacts? You can use the free trial version of CopyTrans Contacts in order to manage your iPhone, iPad, or iPod Touch contacts, calendars, SMS, iMessage, WhatsApp, Line, Viber messages, and notes free of charge for 50 consecutive actions but wait, there is more! 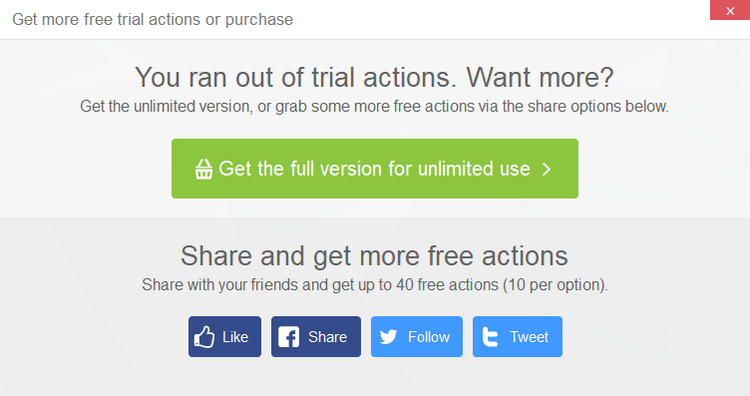 With our sharing options you can get additional 40 actions! Once you run out of your initial number of free actions you can easily obtain an additional set of free actions by sharing your CopyTrans Contacts experience with family and friends. In order to obtain more free actions in CopyTrans Contacts, simply click on the “Actions left” button. A new window listing available ways in which you can get additional actions will appear. To get more free actions, you can Like our Facebook page, or share a Facebook post about CopyTrans Contacts. You can also follow us on Twitter or tweet about CopyTrans Contacts. Select the method you wish to use in order to share your CopyTrans Contacts experience. Each method brings 10 additional free actions. This means that you have a total of 90 free actions available in CopyTrans Contacts before you decide to purchase the full and unlimited version of the program. How to get more free actions in CopyTrans Photo? The first time you run the free trial version of CopyTrans Photo you can transfer 50 photos between an iPhone or iPad and your PC. Want to transfer some more photos for free? Here’s how. Watch as your trial action count increases! Each option grants you 10 extra actions.